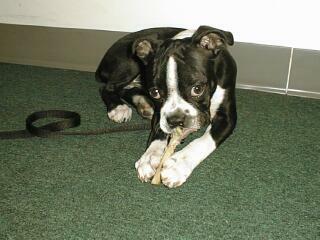 Endicott is a proud, working Boston Terrier who was born on April 4, 2001. He comes to work at Fantastic Transcripts every day and helps as best he can. Endicott loves greeting people, especially children. On his way into work, Endicott gets to meet all sorts of nice people who stop to talk to him. 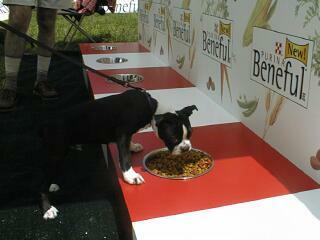 Ralston Purina promoted their new pet food Beneful on the Common. Here Endicott is trying some of the food. He seems to like it. 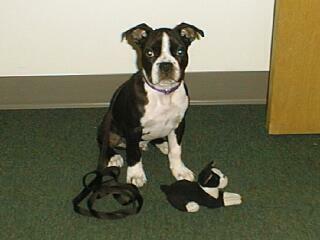 Here's Endicott with his leash and his toy Boston Terrier. 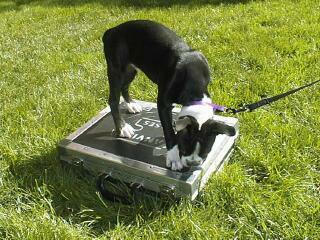 Endicott can't lift his heavy briefcase, so we help carry it into work for him. 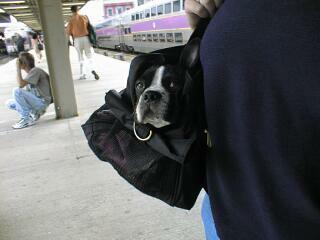 When travelling into and out of work, Endicott is tucked away discretely in his traveling bag. He likes to greet Will, the Metro distributor. 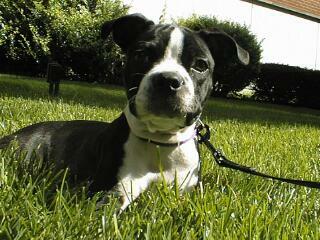 Endicott likes to take a morning stroll through some nearby grass, and sometimes he just likes to lay down in the sun.